55. What if Michael Waltrip Racing never got caught or punished for what they did at Richmond? Background: The 2013 Chase Cutoff Race, the Federated Auto Parts 400 at Richmond, was one of the most-confusing in Nascar history. While Nascar had wanted to create drama with its Chase “playoff” format, they instead created controversy that would throw the legitimacy of the sport into question. What Actually Happened: In attempts to lock certain drivers into the Chase, Michael Waltrip Racing drivers Clint Bowyer and Brian Vickers were given team orders—to spin and to pit, respectively—in order to lock teammate Martin Truex Jr. into the Chase. After damning radio chatter was revealed, Truex was effectively penalized out of the Chase. Truex’s sponsor Napa would leave the team, and MWR would eventually go out of business. What Could Have Been the Turning Point: What if MWR had been “slick” enough in their communication and strategy to not get caught? What COULD Have Happened: Jeff Gordon would never have been the 13th driver in a 12 driver Chase, of course. Furthermore, there may have been less focus placed on Team Penske’s alleged inducements to Front Row Motorsports to have driver David Gililand slow on the track to allow Penske’s Joey Logano to lock himself into the Chase as well. And if THAT Happened…: MWR might still be around today. Napa was a founding partner of the team, and up until these events seemed to be as intertwined with Michael Waltrip as Lowe’s had been with Jimmie Johnson. Additionally, who knows what direction Chase Elliott’s career would have taken without Napa’s considerable sponsorship support. What Else Could Have Happened: Would Martin Truex Jr. ever have become a Cup Series champion? Ironically it took his career nearly ending (due to his release from MWR) to have him wind up with a then-midlevel Furniture Row Racing in 2014. Three years later FRR was a championship team, something MWR may have never become. 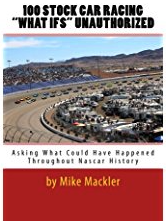 Why It Had to Turn Out The Way It Did: Nascar didn’t like a team stinking up their show, and while they punished MWR for what was essentially cheating, it could be argued that they were punished even harsher for getting caught. Get it NOW at 100whatifs.com!